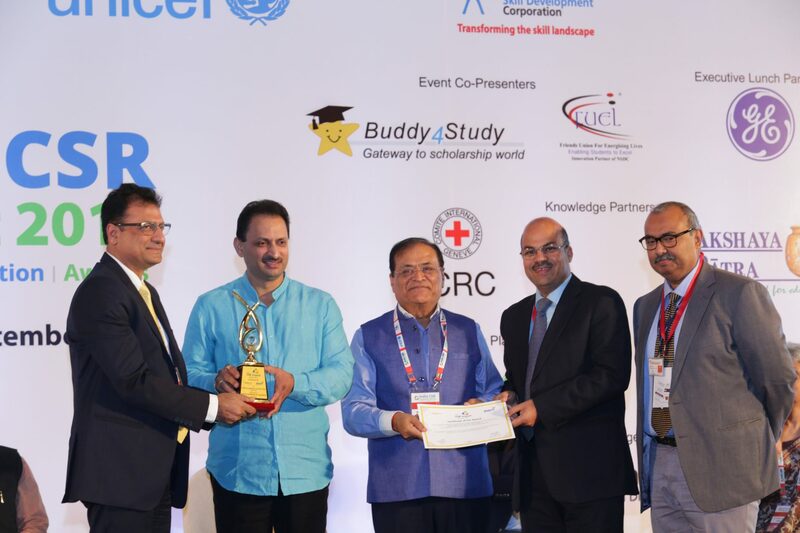 ICICI Foundation for Inclusive Growth won ‘Foundation of the year award’ at the ‘5th CSR Impact Awards’. After a two stage evaluation conducted by the organisers, our foundation was declared as the winner. The award ceremony took place at the Inaugural session of India CSR Summit & Exhibition 2018 at JW Marriott, Aerocity- Delhi, an event supported by National Skill Development Corporation. The award was presented by Shri Anant Kumar Hegde, Hon’ble Minister of State for Skill Development and Entrepreneurship, Government of India and Shri Mahendra Singhi, Group CEO, Dalmia Bharat Cement Ltd in the presence of Dr. Satya Pal Singh, Hon’ble Minister of State for Human Resource Development, Government of India. From left : Shri Saurabh Singh, Senior General Manager, ICICI Bank & President, ICICI Foundation for Inclusive Growth, Shri Anant Kumar Hegde, Hon’ble Minister of State for Skill Development & Entrepreneurship, Shri Mahendra Singhi, Group CEO, Dalmia Bharat Cement Ltd, Shri Anuj Agarwal, Chief Operating Officer, ICICI Foundation for Inclusive growth and Shri Ajay Kumar, Vice President & Head Operations, ICICI Foundation for Inclusive Growth.